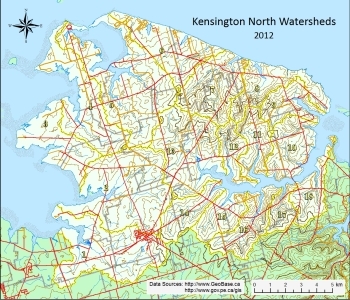 Kensington North is now comprised of eighteen watersheds that empty into the Gulf of St. Lawrence. The Barbara Weit River, Indian River, Oyster Cove and Shipyard River watersheds drain into Malpeque Bay. The Darnley Basin, Sea View, Cousins Pond and Campbells Pond watersheds along the North Shore drain directly into the Gulf of St. Lawrence. Paynters Creek, Long River, Eel Creek, Spring Valley Brook, Tuplin Creek, Durant Creek, Harding Creek, Sutherland Creek and MacIntyres Creek all drain into the Southwest River system which, along with the French River watershed, drains into New London Bay. Kensington North covers an area of 22,182 ha. Over 14,000 ha is agricultural land and about 3,365 ha is forested. It is bounded by 170 km of shoreline and it has nearly 140 km of rivers and streams within its watersheds. The land in the west half of the Kensington North area covering six watersheds can best be described as rolling countryside although there are some areas with relatively high slopes. There are only a few locations along the east side of this area that exceed 60 metres above sea level. The remaining twelve watersheds in the east are much more steeply sloped than the west. And while elevations do not exceed 60 metres in the southern portion of this area, the land in the northern part of this area does rise to 100 metres near the centre. The climate of Prince Edward Island is moderated by the waters of the Gulf of St Lawrence. Winters are moderately cold and spring temperatures stay cool until the sea ice has melted. Summers are moderately warm and fall temperatures comfortable. On average the province receives over 850 mm of rain and 280 cm of snow each year. December receives the highest total precipitation (59.8 mm of rain and 60.5 cm of snow) while July has the lowest (78.5 mm of rain and no snow).